A Chinese-built telecom satellite for Algeria was launched into orbit with the aim of providing television broadcasts, broadband Internet, E-learning and education and emergency communications services. 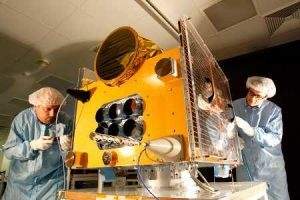 Launched aboard a Long March 3B rocket, heading toward a perch more than 22,000 miles over the equator, the satellite will be controlled from operations centers in Medea and Algiers. For this mission specifically, China has helped Algeria develop a training program for local engineers related to the design and construction of the satellite, dubbed Alcomsat 1. The state-run Algeria Press Service reported the launch was successful. The launch comes after Morocco successfully sent into orbit an advanced French-made satellite for reconnaissance and observation purposes. Written by: KanelkaTagba on December 13, 2017. Posted by KanelkaTagba on Dec 13 2017. Filed under Headlines, World News. You can follow any responses to this entry through the RSS 2.0. Both comments and pings are currently closed.